Nobody knows that better than those of us associated with NASA. Spaceflight today would not exist without the spark of innovation that drove us to build rockets and computers and robots. And small businesses helped us achieve our greatest missions. Small businesses have always been an integral part of NASA. Small businesses have built parts for launch vehicles and planetary science missions, they help us manage our facilities and our data and help keep our organization running smoothly. 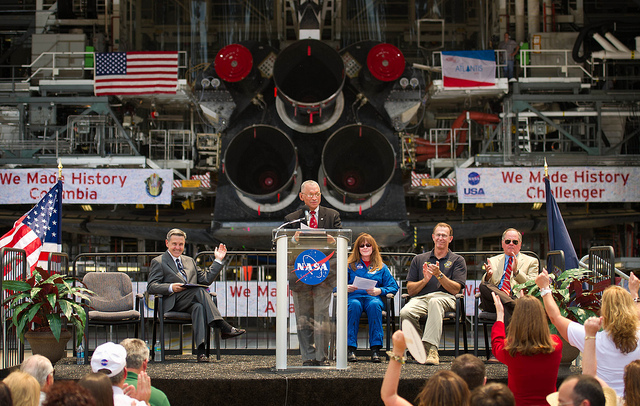 Small business is crucial not only to NASA, but to the nation. And federal procurement opportunities for women, minority, veteran-owned and small businesses are critical to the economy and to sustaining economic development. Today I am in Huntsville, Alabama, home to the Marshall Space Flight Center. I’m at Marshall to salute the center for its strong commitment to expanding opportunities for small businesses, and present them with an award for managing the most effective small business program in the agency. In 2010, NASA awarded approximately $2.3 billion directly to small businesses, an increase of almost 15 percent from the year before. NASA’s large, prime contractors awarded an additional $2 billion in subcontracts to small businesses. Small businesses create jobs and power our economy. In fact, small businesses created 64 percent of the net new jobs in America over the past 15 years. And small business hire 40 percent of the high tech workers in the U.S. Small businesses are often started by people with an innovative product, a creative solution or just a passion for something. We are trying to change the way we do business at NASA, and we need the help of small business to get there. We need the energy and ideas that come from small business owners and their employees; we need their entrepreneurial spirit and innovation. The President is urging government agencies to meet the combined goal of 23% for all federal contracting with small businesses, as well as specific goals for underserved small business groups that, for too long, have been left behind. NASA is working to help the Federal Government not only meet this standard, but also surpass it. But partnering with small business is about more than reaching that goal. It’s about bringing the innovation and ideas of small businesses into the fold. It’s a larger effort to diversify our procurement and make the business of the federal government reflect the many perspectives of our entrepreneurs and make our procurement portfolio continue to be representative of small businesses. Investment in space exploration has long pushed the boundaries of our nation’s technical capabilities. And we’ve succeeded with the help of our innovative small business partners. It was my honor to fly aboard Discovery on the STS-31 mission in 1990 when she brought the Hubble Space Telescope into orbit for us. And on STS-60, when Sergei Krikalev, the first Russian to fly on an American spacecraft, was a crewmember. Discovery also was the orbiter for the final Shuttle/Mir docking mission and, after tragic losses, gave us hope when we returned to flight after the shuttle Challenger and Columbia accidents. The thousands of workers who have made Discovery’s storied legacy possible deserve our deepest gratitude. While today is bittersweet for us, we are also excited about what the future holds for humans in space. Over the past months, we’ve seen many milestones in the commercial space industry that will help us bring humans to space in the future. Commercial space is fast becoming a reality and the capabilities NASA itself is starting to develop will reshape our perspective on what is possible. We’re looking at once in a lifetime opportunities to create the future. Let’s keep that in mind as we celebrate the history we have made and shape it anew. Godspeed to the crew of Discovery on this tough bird’s final voyage! Earlier today, President Obama released his budget for fiscal year 2012. His plan asks us to live within our means in order to invest in the future. NASA accepts this challenge because we know that, in order to win the future, we must out-educate, out-innovate and out-build the rest of the world. • $18.7 billion for fiscal year 2012, which will require us to live within our means so we can make investments in our future. • The budget supports all elements of our bi-partisan Authorization law enacted last year, including a reinvigorated path of innovation, technological development and scientific discovery. • It includes $4.3 billion for the Space Shuttle and International Space Station programs, $5 billion for science, $3.9 billion for future exploration systems (includes $1.8 billion for a Space Launch System (SLS) and $1 billion for a Multi-Purpose Crew Vehicle (MPCV); and $.8 billion for commercial crew) and $569 million for aeronautics research. • The International Space Station will operate until at least 2020, allowing NASA to fully utilize it as a national laboratory for human health research and as a technology testbed. • In these tight fiscal times, tough choices had to be made and NASA has prioritized funding for its partnership with the commercial space industry to facilitate crew and cargo transport to the station. Private companies will innovate to provide safe, reliable and cost effective access to low Earth orbit, and they will be encouraged to develop commercial low Earth orbit (LEO) destinations. • NASA also will invest in the flight systems to take humans beyond low Earth orbit, including a deep space capsule (MPCV) and evolvable heavy lift rocket (SLS), and key research and technology to enable the long journeys. • NASA’s science budget supports both new missions and the many space observatories and Earth observing systems successfully carrying out their work now. • With the fiscal year 2012 budget request, NASA will continue its commitment to enhancing aviation safety and airspace efficiency, and reducing the environmental impact of aviation. • NASA remains dedicated to developing the next generation of technology leaders through vital programs in science, technology, engineering and mathematics. Despite the challenges ahead, this responsible budget sets ambitious but achievable goals that foster America’s continued leadership in space and science exploration. It’s important for us to remember that here at NASA we reach for new heights to reveal the unknown so the things we learn and the things we do benefit all humankind. We DO BIG THINGS, and by working together, we can win the future! 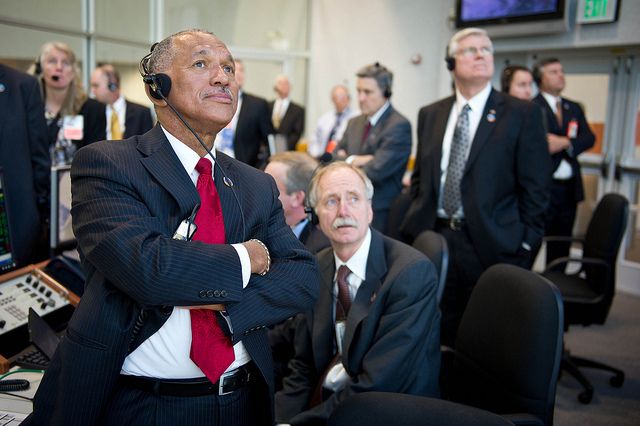 As we celebrate Black History Month across America, I want to send greetings to all and highlight the achievements of African Americans at NASA. Click play below to see my video message. A big part of NASA’s mission has always been to educate students and inspire the next generation of explorers, whether they’re astronauts, scientists or engineers. That mission has never been more important than right now. The President has challenged us to win the future, and to do that, we must win the race to educate our children. I had the privilege today to speak to a great group of students at the MathScience Innovation Center in Richmond, Virginia. It’s always a pleasure to talk to young people. They are eager to create the future. These students know how important math and science is, and their teachers and parents know how important it is that they have a chance to learn and build skills in this area. Studying science, technology, engineering and math, or STEM, opens up many diverse career opportunities and helps our country create a future that innovates to solve problems, create new technologies to meet our needs, and explore the boundaries of our solar system and beyond. What students across the United States and the students I met with today from Albert Hill Middle School learn today will help us be globally competitive tomorrow. Today, the students built paper rockets. Tomorrow, they may be putting the final touches on a new design for a NASA rocket that carries a science payload or a crew of humans into the next great chapter of exploration. The President’s call for us to win the future means we all need the skills and capabilities to stay competitive in the global economy. 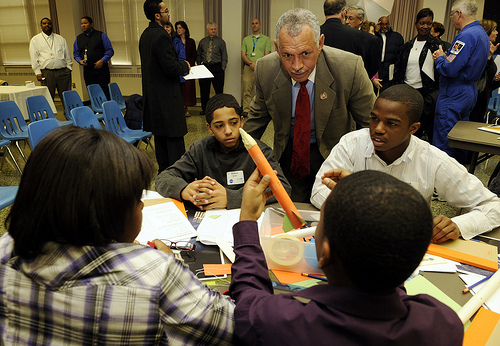 STEM education is not just about filling heads with knowledge. It’s about creating prosperity now and for future generations. As our commercial partners develop better and more cost effective ways for reaching low Earth orbit and we at NASA plan and design the missions that will explore our home planet in greater detail to reach for the outer solar system and beyond, good high-tech, high-paying jobs will continue to grow in the STEM fields. Students who study and prepare for the STEM fields will have the chance to take part in this whole universe of opportunities. As a result of their hard work and determination our country will be stronger and more competitive. Tonight, President Obama delivered a powerful State of the Union message to the nation. His focus on innovation, education and building are the foundations for our future success as a nation – and the key to economic recovery and long-term fiscal stability. At NASA, we’re making contributions in all of these areas. Our education initiatives inspire the next generation of scientists, engineers and entrepreneurs. Our groundbreaking work on innovative technologies to solve some of the greatest challenges we face is why people turn to NASA for help in times of crisis, whether it’s firefighters in California or rescue workers in Chile trying to save trapped miners. And as we continue to maintain our world leadership in human spaceflight, we are working to help build the space transportation systems of tomorrow, incentivizing commercial companies to compete in the space marketplace and reducing our costs. Fifty years ago, another young President propelled a fledgling space agency on a bold, new course that would push the frontiers of exploration to new heights. The 21st Century course that President Obama has set our agency on will foster new industries that create jobs, pioneer technology innovation, and inspire a new generation of explorers through education – all while continuing our fundamental mission of exploring our home planet and the cosmos. At NASA, we’re always reaching for new heights and hoping to reveal the unknown, so that what we do and what we learn will benefit our great nation. Tonight’s message of opportunity and inspiration will guide us as we reach even higher, building a better tomorrow and ensuring that we win the future for this generation and generations to follow. Please continue to keep Congresswoman Giffords, Mark, Scott and all of the affected families in your thoughts and prayers.